It’s the holiday season once again, and time for the Old-Fashioned Christmas Festival in the Historic Depot District in Richmond. Each year the streets are filled with both young and old taking in the attractions and spending time together. If you haven’t yet had the chance to attend this wonderful event, there’s still time! 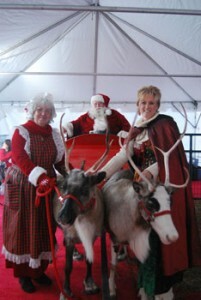 The festival runs each Tuesday in December from 5:00-9:00pm. “You will feel the spirit of the season as you stroll through our historic neighborhood aglow with twinkling lights and luminaries. Voices of children singing Christmas carols will evoke your memories of Christmas past. Enjoy a steaming cup of hot apple cider and delicious Christmas cookies while you take a ride on our Horse-Drawn Carriage and Wagon. 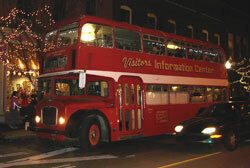 Then, take an exciting trip on an Old Fashioned English Double-Decker Bus! 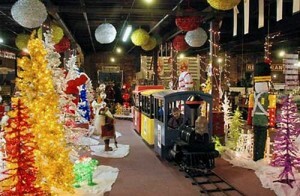 Watch your children’s excitement when they see a favorite attraction, Children’s Train Rides on the Christmas Express in the Winter Wonderland room at The Richmond Furniture Gallery. This room also features one of the world’s largest Christmas Murals and a Fantasyland Train Display. The display features several trains that run around an old fashioned Richmond, Indiana landscape. After the trains, your children (and those of you young at heart) can have your picture taken with Santa Claus! 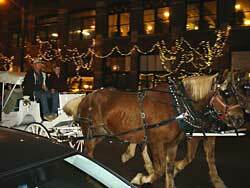 For more information on the Old-Fashioned Christmas Festival, visit the website.